For honor, for adventure, and for the glory of Tyria! Wondrously exciting voyages await you on Guild Wars 2. Traverse the lush yet unforgiving landscapes of Tyria to gain immortality. So get your GW2 card, code & CD key from PlayerAuctions. With millions of users, we’re sure to have all your gaming needs! Guild Wars was one of the most successful MMOs of all time, so it's only fitting for the runaway hit to have a sequel, Guild Wars 2. And the follow-up to one of the best games the genre has ever seen is definitely worthy of its predecessor. It brings the same level of enjoyment the first one did, and adds new features that make it a unique experience. So with a Guild Wars 2 Gem Card or a Guild Wars 2 CD key, you can play this one-of-a-kind game today! The game brings players once again to the world of Tyria, which is under a returning threat: the Elder Dragons, a race that once ruled the world. To thwart this danger Destiny's Edge, a guild that swore to fight the Elder Dragons, re-emerges after its disbandment. In the middle of this conflict are the players, assuming the role of heroes, and following a riveting story of heroism. What makes Guild Wars 2's story stand out would be the world where it's unfolding. It's built on solid lore and beautiful 3D visuals, and responds to players' choices, branching out accordingly with every crucial decision. Other than the game's story and setting, the game also puts a lot of importance on players' personal stories, thus the game's highly liberal class system and visual character customization. Players have five races to choose from – humans, the feral charr, the small yet advanced asura, human-like norn, and the dryadic sylvari – all of which have their own advantages in battle and highly customizable looks. As for combat, players have eight professions to fill, and they don't fall under the tank-DPS-healer trinity that is usually found in other tab-targeting MMO titles. Rather, they are classified according to ability and armor type: light-armored scholar types, medium-armored adventurers, and heavy-armored soldiers. There are no healer classes, as the developers believe that they are restrictive. 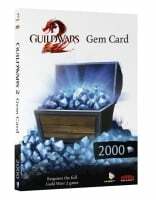 The game is a must-try, and the best way to get into it, especially if one wants a bit of leverage, is with a Guild Wars 2 Gem Card, which can be traded in the game for items that will make adventuring life easier. So if you're looking for one that's at a bargain price, you can always go online and look in RMT trading sites. A lot of them, however, are untrustworthy. Thankfully, there is always PlayerAuctions. PlayerAuctions is an online player-to-player trading platform, a kind of RMT site where players can buy and sell online game-related wares such as accounts, items, and currency – including the Guild Wars 2 Gem Card. And to provide our clients with a secure and convenient player-to-player-trading service, we have put the PlayerGuardian system in place, which protects important info of buyers and sellers. In addition, we have the PowerSeller system, wherein buyers can check the on-site reputation of our sellers. This way, they can choose which ones are trustworthy, and which ones are dubious. And should our buyers or sellers encounter any issues, they can contact our customer services that are reachable 24/7. Once again, the world of Tyria needs help. And we here at PlayerAuctions are here to help you, adventurer, in helping this troubled magical world. Become one of its most prominent heroes, now!